It’s not often Manchester City and Wycombe Wanderers find themselves competing against each other and perhaps even more surprising to discover that the League Two side have got the better of this particular duel. 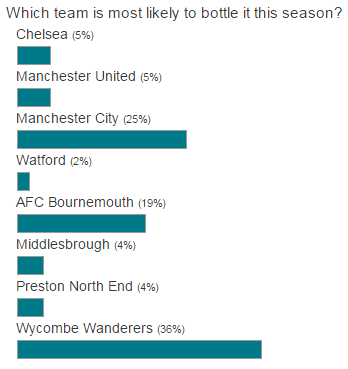 However, the latest Ladbrokes poll has delivered that exact result – although it’s not a battle Wanderers fans will be thrilled to have won. Ladbrokes News readers have voted Gareth Ainsworth’s outfit as the most likely team to bottle it this season. The Chairboys currently find themselves vying for promotion to English football’s third tier with two games remaining. But with an injury-hit squad that’s struggling to get over the line the Buckinghamshire club could fall at the final hurdle. That’s a view shared by thirty-six per cent of you while Manuel Pellegrini’s struggling City polled 25 per cent of the vote given their recently poor efforts at holding on to their top-four status. Premier League hopefuls AFC Bournemouth were third on the list with 19 per cent leaving the likes of Chelsea (5 per cent) and Manchester United (5 per cent) safe from public scorn. Poll ‘winners’ Wycombe face Morecambe at home this Saturday in a match where Ladbrokes make them the 8/15 favourites.